Pat O’Sullivan & Sons Funeral Directors and Monument Sculptors is a second generation family run business and has been providing professional Funeral Arrangements for over 45 years. Pat O’Sullivan & Sons Funeral Homes has two locations in both Clonakilty and Schull, West Cork and provide a complete range of funeral services throughout Ireland. Charles O’Sullivan being a member of the Irish Association of Funeral Directors was awarded the Certificate in Funeral Practice in 2012 having completed the Association’s coursework to enhance the professional services of Pat O’Sullivan and Sons. “We as Funeral Directors consider ourselves fortunate and lucky to have such a competent and devoted staff down through the years who take great pride in their work. Together with our fully qualified staff of Funeral Directors, Embalmers, Sculptors, Masons and grave diggers we provide a full range of funeral services. Our grave diggers have completed the necessary coursework and possess the proper certificates in the practice of grave digging which are required by the Cork County Council. Pat O’Sullivan began his working career as a plasterer for Padraig Walsh in his construction business in Clonakilty. 1968 - Pat O’Sullivan & his wife Kitty bought the Undertaking and Construction businesses from his employer Padraig Walsh. 1974 - 1975 Pat O’Sullivan constructed the first ‘purpose-built’ funeral home in West Cork and from 1974 forward Pat & Kitty O’Sullivan together progressed the business to what it is today. Pat began the outsourcing of crafted coffins to provide a much fuller range of quality coffins sourced here in Ireland. 1980’s - Pat and Kitty O’Sullivan were joined by their two sons Charles and Patrick and their two daughters Mary and Camilla in running the family businesses. Charles found his calling in Funeral Direction from a very young age working with his father arranging funerals. 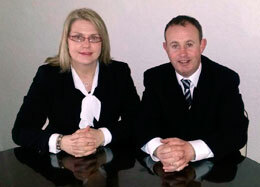 2005 - Charles and Brenda O’Sullivan officially took over the Funeral Home and Funeral Arrangements business. 2008- Charles and Brenda O’Sullivan expanded the Funeral Home to include Charles O’Sullivan Memorials Ltd. as the Headstone and Monuments extension to compliment the funeral arrangement business so they could provide a fully coordinated funeral arrangement service from start to finish. 2017 - Progressing to the present day Pat O’Sullivan & Sons Funeral Directors and Monument Sculptors futher expanded to include Hurley's Funeral Home in Skibbereen, West Cork. It has been a privilege of the O’Sullivan family over these past 45 years to help lay to rest many beloved members of bereaved families. It is our goal and passion to always provide the compassionate guidance necessary at the most difficult time in many family’s lives to ease the burden of arranging a funeral for your recently departed. There is no question too small to ask when organising the funeral arrangements of a loved one. Pat O’Sullivan & Sons being a family run business continues in that tradition where both my wife Brenda and I will assist you with every aspect of arranging a personal and unique burial or cremation for your loved one. We are here to help during this difficult time.